I would never believe that a place like this could be hidden right in the middle of the city centre, if I hadn’t seen it with my own eyes. Skautský Institut is situated in the very centre next to the clock on the Old Town Square and if you didn’t know that it’s there, you would probably never find it by accident. If you happen to be somewhere close and you want to run away from the big crowds and unaffordable prices, it is the right place for you to go. Skautský Institut is a coffee place, snack bar, reading room and a lovely place for hanging out with your friends, but it hides a way bigger idea behind it than just this. It got its name from organising many scout-oriented workshops, discussions, exhibitions and other activities for adults and children about diverse topics, but they are also focusing on the history and position of scouts and the impact of totalitarian regimes on the community. If you feel like organizing your own public or private workshop about anything you have in mind but don’t have the right place for it, you’ve found the right address. 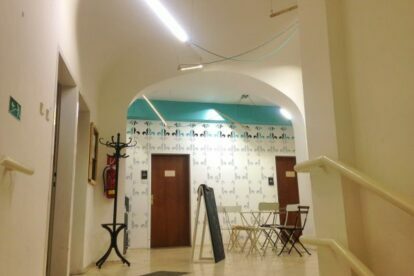 They also provide halls and a small theatre to rent with a special bonus – a view over the Old Town Square. So check out their list of events including debates, film club or yoga classes and I am sure you will find the right time to visit this unique centre with great ideas.